A great piece of kit. I have a lovely old set of amps that I inherited from an audiophile relative that I had rigged to a decent CD player and speakers that had been gathering dust for many years. Thanks to the new Sonos system I am now using them ag...Read moreain. Very easy to setup and you can listen to streaming music, iTunes library (this took a while to figure out - I had to install software on my house PC that runs iTunes) and even podcasts. It has brought a new lease of life to my beloved hifi. I am not new to networked music as I used to have a system of Logitech squeezebox players, but as these are no longer on the market and with my players dying, I decided to go the Sonos route. I hoped the experience would be as simple and satisfying t...Read moreo use. Well, I was delighted with the Sonos kit and the system setup - what a breeze. This is how all products should be - plug it in, bring up the app on my phone and hey presto, it sets itself up. Awesome. To be standing in the kitchen, watching on my phone as the Sonos in the lounge does a firmware update is fantastic. The choice of connectivity is good, the network access is fast, the android app is really nice, and the sound is excellent. I couldn't be more pleased - it does exactly what I wanted it to do, and in a very classy way. All I need to do now is choose which player to add to my system next! Greta bit of kit to expand the Sonos system utilising pre existing HiFi system. Easy Peasy to set up - best part of 2 minutes once wired to mains and connected by phono plugs (supplied). This is my first dip into the world of Sonos - and I have to say I'm impressed! Decided to try connecting via Homeplugs (not officially supported configuration) but was prepared to invest in a Zonebridge if necessary. Turns out there was no need as ...Read moreit works perfectly well. Have also tried the unofficial Android controller app on my HTC Desire HD and that works a treat as well - so no need for the dedicated remote if you don't want it/can't afford it. As far as sound quality is concerned, I ditched the inferior supplied phono cables in favour of some higher quality ones and connected to my Arcam Alpha 8 Stereo Amp. Sound quality using FLAC is very impressive, although not quite up to scratch with my trusty old Marantz CD63KIS. So this is a review of two halves. 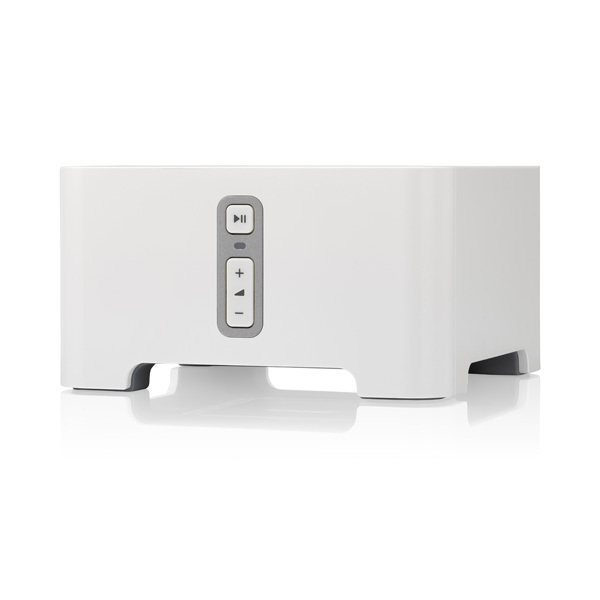 The Sonos kit is great 5 stars - the original service from AMP3 great. The follow up service dreadful.I did not get my free head phones as promised in the first order(I ordered three systems). Then spent the best...Read more part of three weeks trying to get an answer by email from them, no responses to 3 emails. Now - via an order update - that something has been sent. i bought this item to add to my new sonos system found it to be easy to set up and a great product,and what a great web site the above is found them great to talk and a fair price for their products. Bought this along with a ZoneBridge and an iPod Touch to start my home wireless music system and it's absolutely brilliant. Set up was relatively straightforward, even for a bit of a technophobe like me and the first time you sit down to listen and p...Read morelay any track you fancy it seems just like magic! I'd recommend it to anyone and with the great deals from AMP3 I'll be back for an additional Zone Player soon. I bought the BU250 package and needed to dd an extra room. It was so easy to connect this box making it an absolute dream.